Are You Ready To Have Fun like a Scout, Learn like a Leader? Are You Ready To Be Part Of A 100 Year Tradition of World Wide Scouting? Are You Ready To Take Your Unit to the Next Level? Are You Ready To Be a Part Of Something Special, Make New Friends, and Be the Leader You Always Wanted to Be? Wood Badge is the advanced leadership training course for Cub, Venture, Varsity and Boy Scout Leaders along with District and Council leaders. Wood Badge is a six day, two-weekend experience in which you learn more about Scouting, leadership and yourself, along with District and Council leaders. All Scout leaders are encouraged to attend Wood Badge - You just need to have completed your position specific training and YPT. Where does Wood Badge take place? At the Heart of Virginia Council Scout Reservation in Goochland County, VA.
How much does Wood Badge cost? The 2019 course fee will be $285 - which covers all meals, lodging and program for the 6 full days. Payments can be made in three easy installments. A down payment of $100.00 is due at the time of registration. Because it's the "peak experience" course for Scout leaders. The Wood Badge beads indicate that you're a highly qualified, motivated and dedicated Scouter. 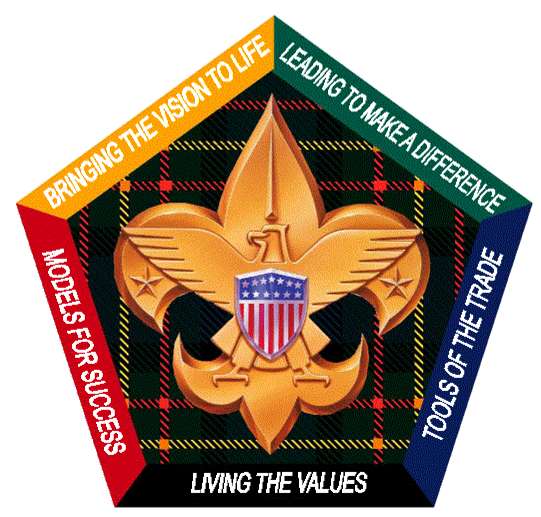 Wood Badge makes you the best possible leader for the scouts in your unit! BSA Professional Staff Member of the Heart of Virginia Council: "This is the best training I have attended in all my years of Scouting." Venture Leader: "The youth in my crew have noticed how much better things are running in the crew." University Professor: "I got a promotion at work as a direct result of the skills I learned in Wood Badge." Cubmaster: "I am better able to run my pack, and it has made a real improvement in my pack." Sign up online at www.hovc.org. Go to the council calendar for March 2019 to register. Wood Badge courses have traditionally filled up quickly with a waiting list. Contact the 2019 Course Director, Charlotte Pemberton for more information by calling or texting at (804) 337-1134 (please give your name) or CSPbear677@gmail.com with "Wood Badge" in the subject line. ALL registrations and course payments are to be made online through a Doubleknot registration account. NOTE: You will be required to enter your BSA ID Number at the time of registration. If your status changes for any reason, please let Course Director, Charlotte Pemberton, know immediately. The closer we get to the start of the course, the less likely a replacement will be available to take your spot. As such, course fees can only be refunded if a replacement is possible, and not within the final four weeks before the course start date. Thank you for your understanding.